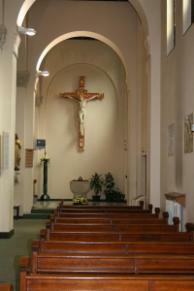 Christian Initiation - Welcome to St Lawrences Church in Feltham, Middlesex. The RCIA is a course for those who wish to receive the Sacraments of Baptism, Confirmation and the Eucharist as adults, and become full members of the Catholic Church. They may have been baptised in the Catholic faith as an infant, baptised in another Christian church, or new to the faith. There are no special requirements for candidates and all are very welcome. Our parish RCIA programme starts in September. Candidates explore the elements of the Catholic faith in their weekly meetings and prepare to receive the Sacraments of Initiation at Easter. The programme includes a service of enrolment at Westminster Cathedral for all the candidates from the Diocese of Westminster. A Mass of Thanksgiving, also at the Cathedral, concludes the celebrations. Please speak to Fr John or Deacon Colin Macken if you have any questions about receiving the Sacraments as an adult, or if you would like to know more about the Catholic faith.